This is an artist's impression of an embryonic galaxy brimming with star birth in the early Universe, less than a billion years after the Big Bang. The galaxy is still forming and looks nothing like the majestic spiral and elliptical galaxies that are the near neighbours of our own Milky Way Galaxy. 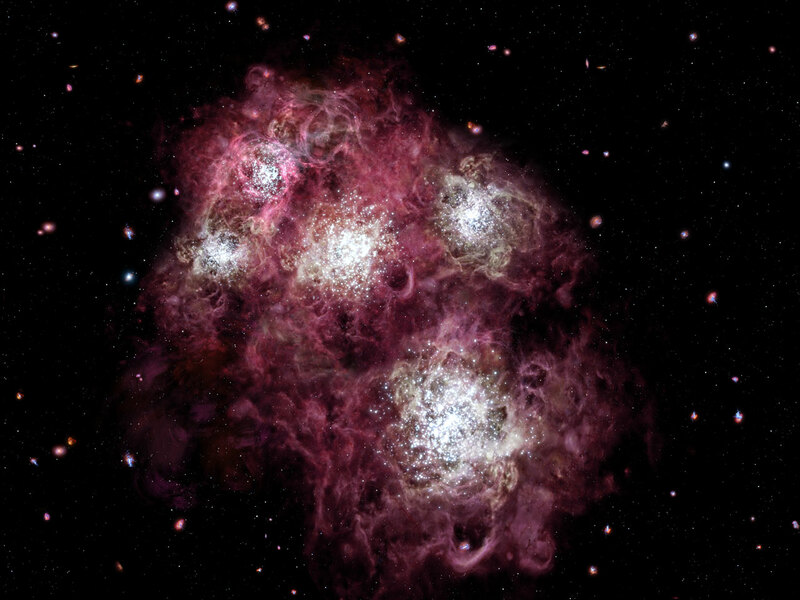 The illustration shows several tight clusters of stars bursting to life. They are surrounded by glowing bubbles of hydrogen gas produced by massive stars erupting as supernovae. A tapestry of young, developing galaxies is in the background. The Hubble Space Telescope discovered a young star-forming galaxy like the one in this illustration. The galaxy spied by Hubble was born just 700 million years after the Big Bang.